The sheer number of sites that have launched in 2016 which have the words ‘slots’ or ‘spins’ in their name make it clear how much the popularity of that already hugely popular gaming type has grown in recent years. One such site is Wild Slots, a site that started life in the last few months, and thus has a huge uphill struggle ahead of it in order to compete. The iGaming market has always been a tough one to crack, but it’s fair to say that the level of competition has grown a huge amount over the last year, making any site that has been launched this year in need of some serious hard work to get itself noticed. Just having excellent content isn’t enough anymore, sites also need to offer top quality customer service, exciting promotions, and, perhaps most importantly, have something unique about them that makes sure they will get noticed despite the busy market. Having a well-known and respected name behind you certainly helps, and as part of the EveryMatrix network which already boasts the likes of Next Casino, Wild Slots certainly has that, but does this site has enough to make the necessary impact? First impressions are perhaps more necessary in the world of online casino sites than they are anywhere else, and Wild Slots certainly makes a good one. This is a site with a classic feel to it, that also brings a modern twist to keep it feeling relevant. The main colour scheme here, for the upper part of the pages at least, is black, which is a good colour for a sophisticated look. The logo is a combination of white and fluorescent orange, which brings the name of the site to life nicely. As you scan down the page, you will find one of the most popular design tools for modern online casino sites, as the most popular games available on the site are available directly from the homepage via thumbnails that have been used as part of the design theme to great effect. The one problem that Wild Slots has here, which is a common one, is that the background behind these thumbnails is white, and when taking into the account the rest of the design work at the site, it simply makes this section look unfinished, which is a shame, but a small complaint for a site that looks so good. Titles at Wild Slots come from a host of the biggest names in the industry, software providers include, but are not limited to, Microgaming, NetEnt, and NextGen, offering the biggest and most popular games around. 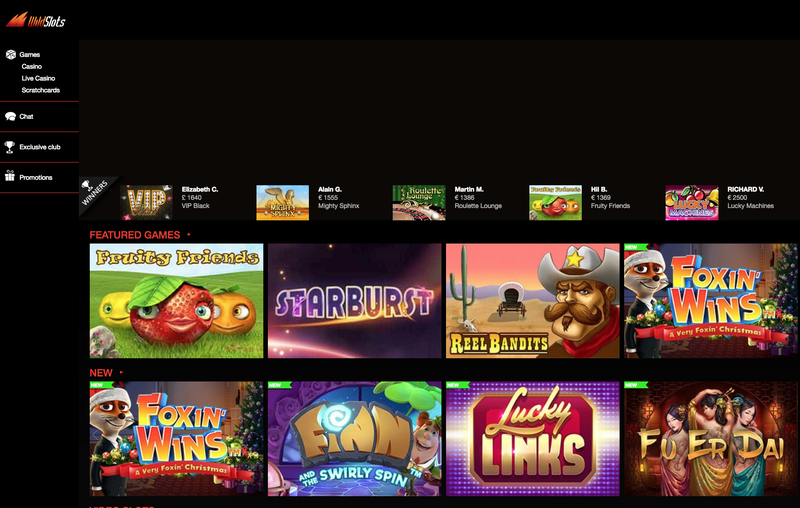 Obviously, as the name suggests, the focus here is on slot games, and Wild Slots has a collection of new releases that will appeal to players of all types, including Dragonz, Theme Park: Tickets of Fortune, Fairytale Legends: Red Riding Hood, SuperFlip, 1421 Voyages of Zheng He, Wheel of Fortune on Tour, Lost Vegas, Motorhead, and many more. If you prefer classic titles, then you will be happy to hear that the likes of Da Vinci Diamonds, Cleopatra, Gonzo’s Quest, and Starburst are also available. Most of the games here are available at other places, and there is little to speak of that counts as unique in any real way, however, this is a consistently good site that offers top quality customer service, an attractive design concept, and a host of good games, meaning that it is a particularly good site for new players, but will also have something of interest to the seasoned veteran who is looking for a new place to play.